I’ve always been skeptical of open world sandbox games. Often, a large portion of time is spent traversing city roads—hardly something that fits into the paradigm of video games as obstacle courses. What do you make of gameplay that mimics your morning commute? Well, sans traffic laws and car insurance. Right off the bat, Lego City Undercover was proud to fit the sandbox mold. Lego City itself has several different districts, all put together more or less like any city you or I might know. And on my way to my first mission, I steered a police car to the police station through mild traffic. 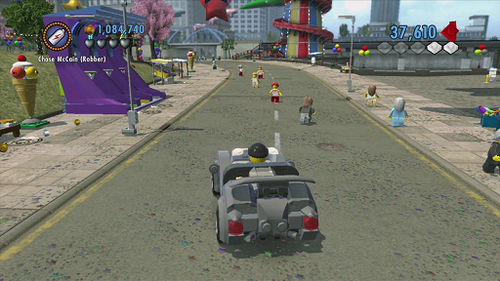 Cruising around Lego City is one of the more conventional sources of fun to be found in Undercover. The missions themselves also flew in the face of what I understood as gameplay. The action required no finesse, and the puzzles required no thinking; the game was one step away from playing itself. In one early mission, I chased down miscreant clowns. Here, I had to clear puzzles, but the solutions were provided; in order to reach one clown, I had to carry a box to a designated spot and use it to climb higher. Places where you can exercise acrobaticry are clearly marked by white and blue bricks. Another job had me chasing criminals along rooftops, leaping from building to building and running along skyscraper walls. However, the freerunning was bereft of finesse; all I had to do was hold forward on the joystick and press the jump button any time my character came up to a patch of blue and white Lego bricks. Doing so activated certain scripted events and advanced me towards my goal. And things never got much more complicated than that. Without any puzzles to solve or challenges in execution, gameplay went smoothly on each mission. Even if I managed to die, I’d respawn there on the spot with no progress lost. There’s combat, too, which can mostly be handled by mashing either Y, X or A.
It’s worth noting that I did encounter new abilities over the course of the story, but they all felt similar. With the criminal costume, I could use a crowbar to pry open certain doors; as a fireman, I could chop down wood to open certain doors. Six of one, half a dozen of the other. 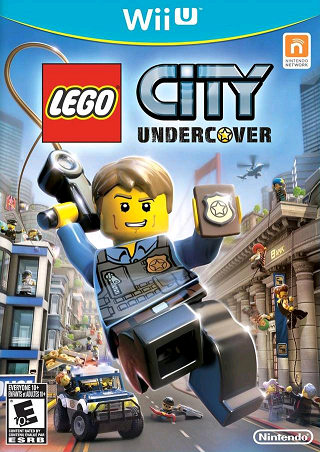 So, I couldn’t find a way to value Lego City Undercover through its challenges. I began to play slower in an effort to notice aspects that might have escaped my attention. Then, I realized just how well Lego City Undercover conveyed what it wanted of me. If you’ll allow me a tangent, Undercover is the opposite of games like Metroid and Resident Evil. In those titles, you’re dumped in the middle of an absurd, fractured world, and it’s your job to make sense of it and somehow put it all together. In Metroid, you might wander into one area, only to find that you need the High Jump boots to make any progress. Or, in Resident Evil, you might pick up a shotgun without realizing that it triggers a lock trapping you. It’s never exactly clear where you need to go next, and I get a thrill out of assessing my options and putting them all in the right order. 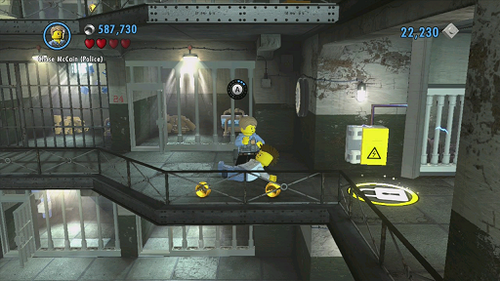 Lego City Undercover has the open-ended structure of Metroid and Resident Evil, but everything is clearly labeled. If I saw a grapple point, I knew immediately that I could attach to it and reach a higher area. If I saw a pot with seeds, I knew immediately that I didn’t have the ability to grow flowers yet. Powers may not be distinctive in how you use them, but they have very clear visual cues. And one of the genuinely nifty things about Lego City Undercover is the distinction between destructible and indestructible objects. If it’s made of Lego bricks, it’s either an object you can destroy or an object you can use; if it looks realistic, then you can’t do anything more than walk on it. It’s a simple touch, but it’s also a distinction plenty of games struggle with. So, for what it’s worth, it was remarkable how clearly Lego City Undercover conveyed everything to me. Anyway, wandering around Lego City exposed me to more than straightforward communication. Like any good sandbox game, there were sidequests to conquer. I chased down a robber here and cleared a vehicle time trial there. Unlike the cordoned-off story missions, these took place out in the open of Lego City. I pursued rioters through a park filled with people on a calm Sunday stroll and raced a stolen sports car through standard highway traffic. Lego City is a bustling world, and I honestly got a kick out of getting to do stuff in it, even if the gameplay was bland. Come to think of it, Undercover was able to marry convenience and excitement using vehicles. I earned Lego bricks by ramming cars through Lego objects around the city, whether they were newsstands, lampposts, or picnic tables. This was satisfying enough in itself, but the bricks I earned then let me build up select parts of Lego City. Plus, if I crashed into enough stuff in a row, I built up brick multipliers and eventually earned temporary invincibility. Plowing an invincible motorbike through a firetruck seems like the kind of crazy havoc that sandbox games love to tout. So, the excitement of ramming into stuff also granted the convenience of getting to build more. Don’t get me wrong—I still don’t understand how this is a gratifying experience. I get that part of sandbox games is creating your own fun, but running over people with their own cars and hurling eggs at unsuspecting citizens is amusing for only so long. However, there is a certain elegance to how it all ties together. This is a sandbox game for sandbox game fans. If you enjoy the genre, this owns it entirely. One cutscene contains nods to The Maltese Falcon and The Matrix within 30 seconds of each other. This is a sandbox game for sandbox game fans. 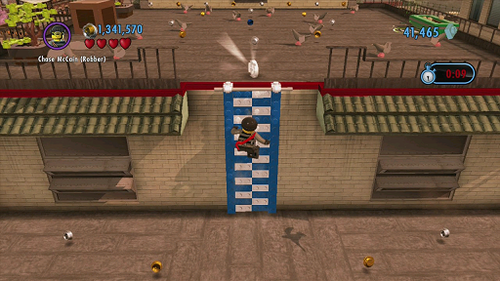 Lego City Undercover is unapologetic and won’t do much of anything to get you into the genre. Plenty of gameplay ignores vehicles, resulting in a lot of bland game time. Not a lot of variety in the humor—what I thought was charming at first became tiresome within a few hours. Lego City Undercover is pretty shameless about its genre, but it doesn’t fail to chart new territory. Value Verdict:Purchased new in 2013 for $49.99. There is a metric ton to do here. If you enjoy putzing around in a silly Lego world, there’s a staggering amount of tasks to take on.